Did that cart just move? Boy, a lot of creeps work at Tesco these days. 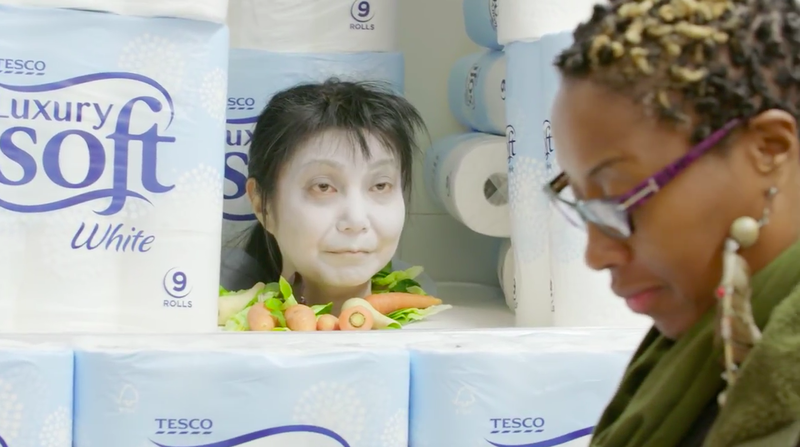 Or so it would seem from BBH London's "Spookermarket" campaign, which includes an amusing 90-second hidden-camera video, shot in one of the British chain's stores. Folks who head for the toilet paper display come face-to-face with the scariest scare of all. Hey, the most useful product will be right there if somebody had an accident. The video, eclipsing 10 million combined views across Facebook and YouTube in less than a week, prompts users to watch four additional clips, where they can learn how to carve Jack-O'-Lanterns and create other Halloween novelties, including a severed head in a jar. It's all in the spirit of branded seasonal fun, in line with Tesco's customer-focused mantra: "Every little helps." Besides, we all know there's really nothing to be afraid of at the grocery store—right?